EA dropped a trailer for Star Wars Battlefront II during Star Wars Celebration. Unlike its predecessor, the new game will traverse all three Star Wars trilogies and that's a mouthwatering proposition for fans. The upcoming sequel will include a single player (SP) campaign written by former IGN staffers Mitch Dyer and Walt Williams. The latter is best known for Spec Ops: The Line. 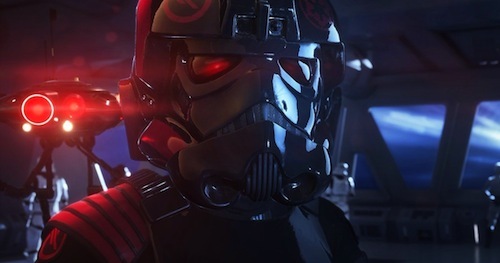 Star Wars Battlefront II follows Iden Versio (Janina Gavankar), commander of Inferno Squad an Imperial special forces unit, in the wake of the second Death Star's destruction in Return of the Jedi. It's an interesting premise focussing on the Empire's perspective with a female protagonist a la FemShep fighting for Cerberus in Mass Effect 2. Will Versio side with the Rebellion by the end or remain faithful to her beloved late Emperor? Gamers will learn the answer this November. As with Mass Effect: Andromeda. EA Access members will have early access to Star Wars Battlefront II on Xbox One. Looking forward to Star Wars Battlefront's single player? Let me know in the comments below.